A device that could be either the Moto X+1 or a new DROID variant showed up at Geekbench within the last couple of days, outing a couple of specs along the way. Remember the Verizon device in the mystery box from earlier in the week that sported a model number of XT1096? The device that stopped through Geekbench showed up with a model number of XT1097. We could be looking at a different carrier variant, or again, it could be another DROID family member. Either way, the phones are more than likely related with model numbers so close. The benchmark gives us the processor, which is looking like a Qualcomm Snapdragon 801 clocked at 2.5GHz. The processor is showing as the MSM8974, which could be the Snapdragon 800, though the 800 typically tops out at 2.3GHz, whereas the 801 tends to run at 2.5GHz. Previous leaks suggested an 800. We can also see that the device has 2GB RAM. 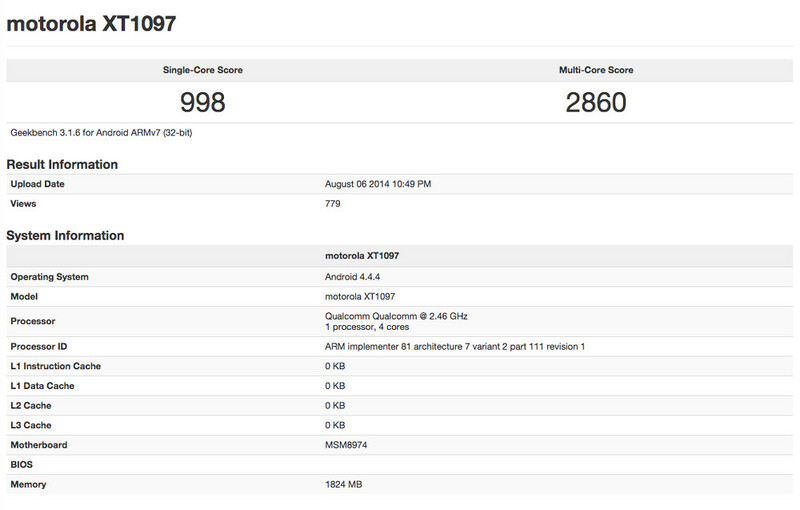 Take what you will from the scores displayed, but this Motorola device would top Geekbench’s charts. The Galaxy S5 currently sits atop the list with single-core and multi-core scores of 933 and 2820, respectively. Things are starting to shape up nicely. Now, if we could get some sort of timeframe for launch.